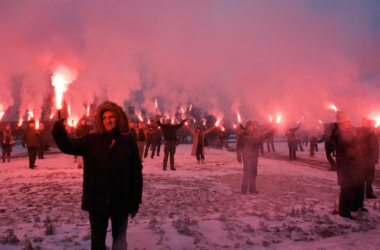 The recently opened Poland: Land of Folklore? exhibition in Warsaw repeats ongoing silences in today's Polish museum practice. The pretext for this short set of observations is a visit to the newly opened exhibit Poland: Land of Folklore? at the Zachęta National Gallery of Art in Warsaw. 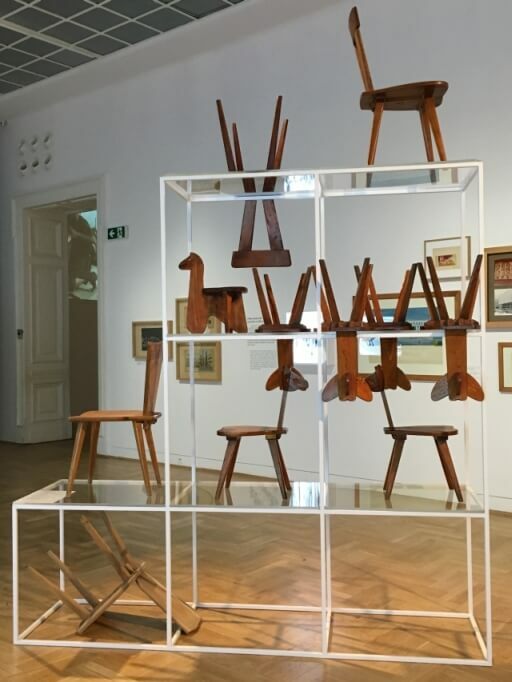 The compelling, beautifully installed exhibit showcases the Communist-era “branding” of Poland. It presents the country as a modern yet deep-rooted land, with a colorful vision of a united, tradition-inspired, forward-looking Polish peoplehood. The image was at once ideologically appropriate, nationally celebratory, and globally exportable. From the performance of Poland at international youth gatherings through song and dance, to the patronage, mentoring, and marketing of its handicrafts and design via the institution of a state-run network of Cepelia stores at home and abroad, the exhibit takes a critical look at the whole-cloth invention of a new national imaginary in the early years of the Poland’s People’s Republic (PRL). Thus this colourful array of “folk” products and performances is today a sign of all that was wrong with the previous regime: it reduced culture to propaganda. 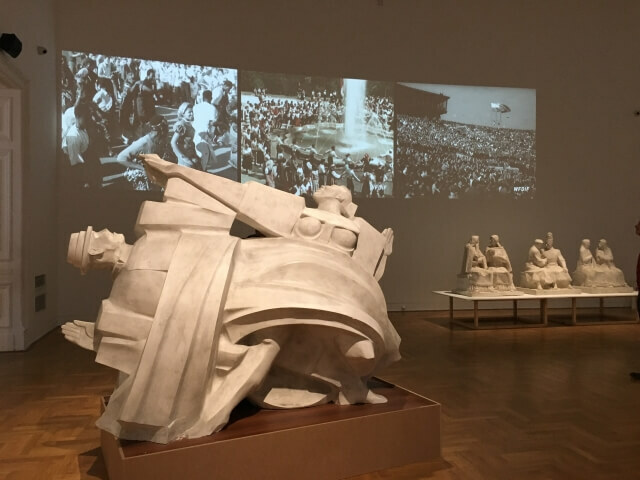 All exhibits – even critical ones like those typical for an avant-garde institution like Zachęta – are of course arguments, and as such they betray the preoccupations of their social contexts and historical moments. Despite being a progressive institution, the show partakes in something of the general post-1989 backlash against all things tainted by association with the socialist era. Indeed, as the curator herself points out, the discredited socialist state, the “Polska Republika Ludowa,” had the notion of the “Folk” (“Lud”) at the core of its identity. Thus this colourful array of “folk” products and performances is today a sign of all that was wrong with the previous regime: It reduced culture to propaganda. It undertook a superficial celebration of the peasantry by urban elites while simultaneously destroying their way of life. And it replicated longstanding relations of patronizing inequality, while making the social conflict inherent in these relations invisible. But the breadth of both the exhibition’s exploration of the state’s use of folklore and its inquiry into “otherness” is curiously lacking, in ways that replicate some of the very silences it seeks to critique. Fascinating and true though this view may be, the introductory text allows that the exhibition will answer a broader set of questions – among them how the “people’s” government used folklore, and how its status changed when it moved into museums and galleries in the first decades of the PRL. 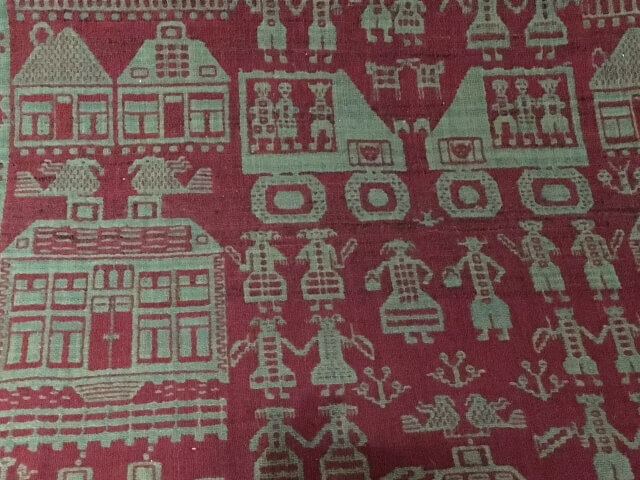 It also states that the exhibit would inquire about the “place of the folk artist – the other – in the art world.” But the breadth of both the exhibition’s exploration of the state’s use of folklore and its inquiry into “otherness” is curiously lacking, in ways that replicate some of the very silences it seeks to critique. 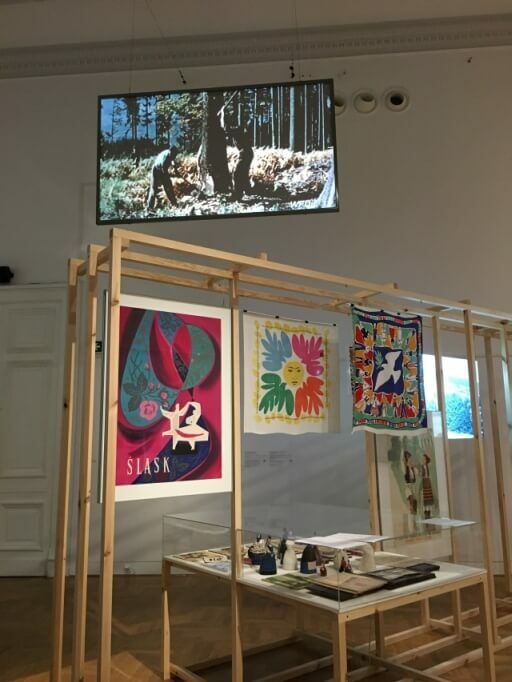 Indeed, the curatorial gaze brought to bear on the PRL’s production of “the folk” in Zachęta’s gallery shares some of the same blind spots with the “countryside as seen by ethnographers” that is the partial subject of the exhibition. If a key critique of PRL-era cultural production was its exoticization and instrumental treatment of the peasant-workers it intended to celebrate, these central subjects of interest hardly make an appearance in the gallery. To make sense of their work, we are shown the structures imposed by the state and at times their clear influence (e.g. carpets hand-embroidered with tractors), but with no insight into the human agency that in part determined the outcomes. We get ideology, that is, but not experience. How did the provincial peasants who were being called on to produce “their” culture on an industrial scale react, engage, navigate, and negotiate with their new mandate? This emphasis on state ideology over individual experience re-creates any number of that ideology’s own exclusions, some of which peek through but are left unexplained. But rather than fault only communist-bashing, another silence in the present exhibit offers the opportunity to discuss a pervasive issue in contemporary Polish museology, namely the unspeakability (to be distinguished from the absence sensu stricto) of the tangle of issues relating to the image and fate of Jews in Polish society. Poland: Land of Folklore? approaches its mandate of “presenting the complexity and ambiguity of this cultural phenomenon” by touching on issues of politics and social class, the global contexts of international relations and export markets, and even the nostalgic inspiration of modern art’s aesthetic appropriations. But particularly as the exhibit billed itself as dealing with “how the people’s government made use of [folklore]” as propaganda, and how “decisions were made [about] what is folk and what is not,” it was strangely mute on a key category traditionally central to folklore-as-statecraft, namely ethnicity. Adorned with flowers and circle-skirted dancers, folklore here served to mask not only social disparities, but wholesale demographic revolution. The Herderian idea of nations as homogenous ethnic collectivities possessing their own singular “spirit” or character (as manifested in folklore, dance, music, and arts) stands at the heart of 19th century national ideologies. “Lud,” in other words, equals “Das Volk” – with all its anti-cosmopolitan, racialist potentialities. Among the seismic changes that Poland underwent in the early postwar years, perhaps the most striking was it having turned from a multicultural nation that had historically been no more than 60% Polish Catholic, to one in which to be a Pole was an ethnic category synonymous with Catholicism (“Polak to Katolik”). Poland lost its Jews, Germans, Ukrainians, Belarussians, and Roma by way of an unprecedented genocide, followed by a series of ethnic cleansings, and a territorial shift involving hundreds of kilometers and a massive population resettlement. The great violence at the heart of the transformation of both multi-cultural Poland into ethnic Poland, and a 100,000 kilometer swath of Germany into Poland’s “Recovered Lands,” was elided in government-sponsored regional tourism posters (where Schlesien becomes the candy-colored Śląsk on display in the exhibit’s opening gallery). Adorned with flowers and circle-skirted dancers, folklore here served to mask not only social disparities, but wholesale demographic revolution. More than simplifying, abstracting, and distracting, these images worked to graft a sense of Polish indigeneity onto what was foreign soil. If dwelling on the traumas of what Poles had suffered, witnessed, or perpetrated during or just after the war clashed with socialist optimism, the disappearance of Jewish neighbors, in particular, was a topic that no institution was keen to touch. Yet wooden sculptures of Jews – sometimes as subjects of Nazi persecution – emerged spontaneously as part of the new folk art canon across the country, as woodworking gave individual carvers means of expressing local and national memories. 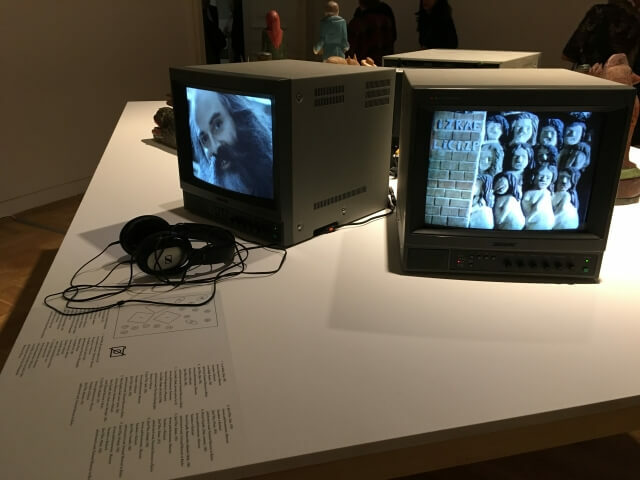 In the gallery that re-creates Aleksander Jackowski’s 1965 Others (“Inni”) exhibit, the curator anachronistically included clips from Andrzej Wajda’s 1978 black-and-white documentary film Zaproszenie do wnętrza (“Invitation to the Interior”) featuring German folk art collector Ludwig Zimmerer presenting his collection. The macabre close-ups of sculptures like Zygmunt Skrętowicz’s “Bełżec” (Belzec) cycle of wooden bas-reliefs (płaskorzeźby), depicting naked Jewish women herded into a gas chamber, or Władysław Furgała’s sculpture of Father Maxmillian Kolbe in a death-camp uniform (pasiak) surrounded by barbed wire and a Nazi guard, comprise the only suggestion of the constitutive violence underlying the very notion of “Lud” and its origins in “Das Volk.” The short film clip points to less colourful aspects of “otherness” that bled through cracks in state-sponsored cultural programs. But why is a muteness produced by the postwar socialist state’s narrow, sanitized framing of folklore reproduced by critical 21st century curators? 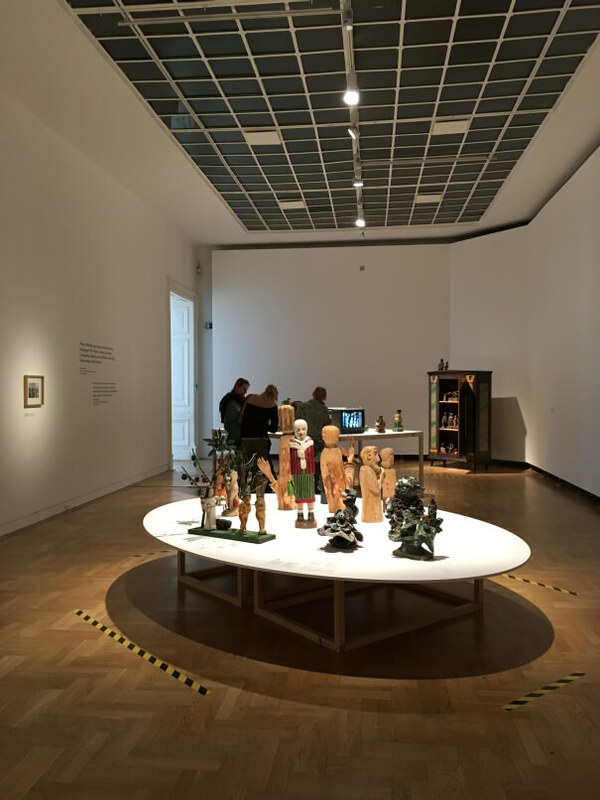 Zachęta visitors are given no tools to understand (or even notice) either PRL folklore’s monoethnicity, nor the presence of both Jews and racialist violence that the exhibit subtly includes. It is as if both during the PRL and today, privileging the top-down voice of ideology allows cultural elites to avoid dealing with difficult topics that inevitably bubble up from below. Such silences around Jewishness can be found in many exhibitions treating Polish cultural history, where Jewish material may be present (by dint of its sheer inextricability). But it is un-, under-, or misinterpreted, leaving its unsettling resonances potentially readable (by an informed viewer) but seemingly publicly unspeakable. Leaving the Land of Folklore? exhibit, I decided to pop into one of Zachęta’s other galleries, and happened to catch the last day of the modern art show Bogatcwo (“Money to Burn”). Bogactwo featured visual representations, stereotypes, and symbols of wealth from the 1990s through the present that explore the experience of economic shock in modern Polish culture in which, per the introductory text, “there has been very little affirmation of economic success or career as a life goal.” The cavernous rooms were filled with an array of shiny objects and bling-y slogans, showing how the “best” of the West was seen – alternately yearned for and despised by Poles. There were piles of chunky faux-gold chains served up turkey-dinner-style under glass, ceiling-high black wallpaper repeating Gucci-like currency symbols in gold type, a cardboard sportscar, a room wallpapered with floor-to-ceiling photographs to replicate standing inside a bank safe, a striking pink-and-black slogan proclaiming “Give me everything” (“Daj mi wszystk0”), and a massive “kebab” of Polish amber, waiting to be sliced off of its revolving skewer. The works imagined, grasped for, counterfeited, and destroyed riches in their attempt to express “Polish fantasies and notions of wealth” during the country’s transition to capitalism. Yet the suggestion that Jews have figured centrally and problematically in Polish economic fantasies (and realities) appears nowhere in the gallery. Yet one of the most interesting, and uniquely Polish cultural products of the period in question – and one I fully expected to find in this show where modern art approaches engage with “ethnographic” objects like Piotr Uklański’s first American dollar – is the proliferation of so-called “Żydki”: Jews holding coins or counting money, rendered in figurine or portrait (obrazek) form. Standing next to cash registers in shops, gas stations, and restaurants across the country, they are the consummate visual representation of what the exhibit’s curators call “Polish fantasies and notions of wealth.” Such Żydki are both an authentic folk tradition (accompanied by ritual practices that ensure their power to attract funds) connected to the ruralisation of cities mentioned in Land of Folklore?, and perhaps also a traumatic after-effect of what philosopher Andrzej Leder called Poland’s “sleep-walked” socioeconomic revolution in which ethnic Poles stepped into the space emptied by the country’s murdered Jewish population, the country’s originary merchant class. It is hard not to read Jewish absence into Ewa Axelrad’s giant photograph of a gold tooth, which echoes Jan Gross’s detailing of Polish post-war profiteering from the Jewish genocide in his book Golden Harvest. Yet the suggestion that Jews have figured centrally and problematically in Polish economic fantasies (and realities) appears nowhere in the gallery. Given the number of significant new museums in Poland dealing with Jewish subject matter it would be preposterous to argue that Polish curating is silent on the theme of Jews. To the contrary, as exemplified by the world-class Polin Museum of the History of Polish Jews, the Jewish theme is a core component of Poland’s new museological landscape. But a closer look at museums that deal with key narratives of “Polish” history, culture, or art (e.g. the Warsaw Rising Museum, the Ethnographic Museums in Warsaw and Krakow, the National Museum) reveals both stark absences and awkward “otherings” of Jews, raising the question of whether the “boom” in Jewish museology may contribute to an unwitting new ghettoization of Jews, recreating a situation where both curators and publics assume that Jewish material belongs in “their” museums, not in institutions seen as telling “really” Polish stories. In Poland the pluralizing gaze has not reached a confident critical mass. The exhibition “Poland – Land of Folklore?” can be visited in the Zacheta National Art Gallery in Warsaw between 15.10.2016 and 15.01.2017. Erica Lehrer is Canada Research Chair in Museum and Heritage Studies at Concordia University in Montreal. More of her writings can be found on Academia.edu.